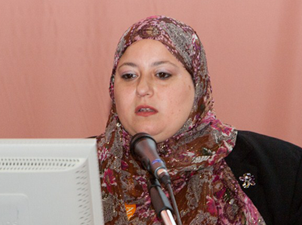 Malak Reda, of the Egyptian Centre of Economic Studies, during the AlmaLaurea International Conference "Human Capital and Employment in the European and Mediterranean Area" held on 10th and 11th March 2011, asked for a second of silence for those who passed over during the "Arab spring" revolution. On the occasion she spoke of labour market, gender differences, youth employment and higher education. "The changes in place in the Arab countries, will eventually lead to much better and productive economies with higher gross rates and able to contribute positively to the global economy." "Those changes to take place, need the support of the international community". What do you think of the situation of the Arab countries at present? What are according to you the main measures to be implemented in order to improve the situation? "I believe that a lot of Arab countries right now are witnessing a wave of change and the wave of change is basically calling for dignity, calling for decent level of live, equality of income distribution and lesser level of corruption and favouritism that is very high in lots of Arab countries. If this change takes place, then we will see much better and productive economies with higher gross rates and able to contribute positively to the global economy". In your opinion, what will be the effects of the “Arab spring” and in particular of the Egyptian revolution on the labour market of Egypt? And what will be the effects on the young Egyptians? "Concerning the labour market, I believe we have a serious challenge to meet in Egypt in the current years, given the fact that a lot of young people are coming from Libya and from the Gulf region countries that start to have some kinds of protestations. Those people returning adds to those who are going to be laid off due to the current revolution and to the probable downturn or slow down of the economic activity. In Egypt the need would be to find jobs and adequate vacancies also in the light of the pressure in terms of housing; therefore there is a need to have a kind of national project in order to employ as much as possible those temporarily unemployed. Here there is also a call for international donors and development banks to assist North African countries in having strategic projects that would employ those unemployed due to the present circumstances. Before I reply to the next question". How can inequality of access to education and later to the labour market be reduced for the young Egyptian people? "The inequality issue needs to be addressed via improvement in primary education, especially in the quality of education as there is a need to have a proper match between the calibre or the outcomes of education and the needs of the market to reduce inequalities and trans-generational poverty. Simply the mismatch results in some people getting higher salaries and other not able to survive. Thus having a better match between demand and supply, the labour market and the graduates of schools and universities, would help solving the inequality issue in one dimension. Give some incentives to the students coming from poorer income levels or rural areas to benefit from high quality tertiary education or to grant some kind of scholarships would be another effective measure". How do you rate AlmaLaurea? Do you think the AlmaLaurea model should be extended to the Middle East countries too? "I really was impressed to learn about the AlmaLaurea model, the database and how is this active to solve exactly the issues that I think is at the centre of inequality, which is demand and supply of labour and of those who are educated. Yes, I believe that Egypt should benefit from AlmaLaurea as well as the other countries of the Middle East region".